She was born to be queen. From the moment she first opened her eyes in the darkness of the hive, she knew. There were no thoughts, no questions and no doubt, all the others were just different. Her form kept changing and expanding although she was already taller and stronger than her people. She had always been content in her dark hideaway until that particular day when she felt a sudden urge to leave the hive. She didn’t know what was to come never before had she been to the outside world, but nothing would stop her now. Through many crooked tunnels she went until she finally got out into the open. Oh how big and splendid it all looked, she simply had to see it for herself. How sharp these green grass blades seemed to be how everything glistened with myriad pearls of dew. As she went out to explore this new world she caught her reflection in a single drop. There she saw for the first time what she had always known, something had made her special. Her body was created in the most artful way imaginable. Every segment of her upper body was in perfect alignment, elegantly streamlined almost geometrical, reflecting the light and colors surrounding her. Below her tiny waist she had grown a strong shining armor, impenetrable scales which overlapped each other and made her feel truly invincible or even lethal if someone would dare challenge her. As the first light fell on her back she spread her wings and took off. Insects do remind me a bit of aliens, to be honest. They are so very different and un-human like so strange and super efficient. Getting a clear vision for this contest was not so easy this time. 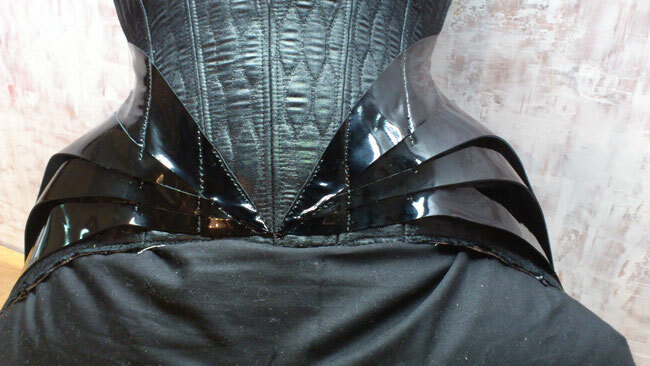 I had no special insect in mind when I designed this corset. It was more the idea of the exoskeleton chitin shell that intrigued me. So I tried to translate these shapes and features into a human form to replicate the shining segments and give it the streamlined shape and feeling of an insect’s body. I challenged myself with keeping it simple and stylish. 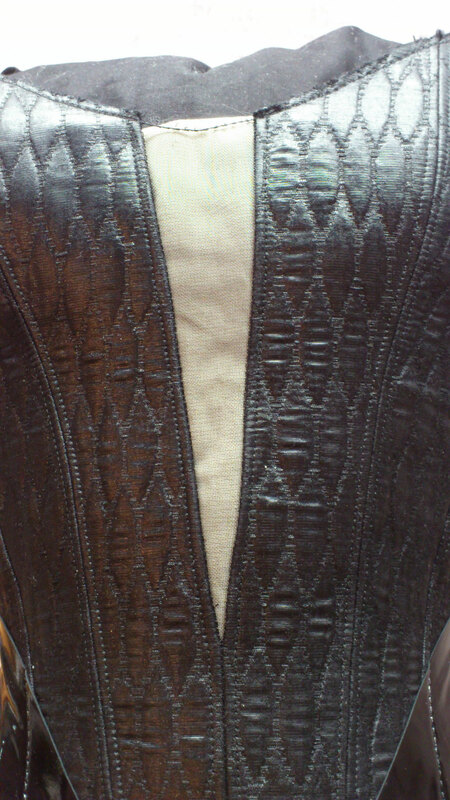 It’s easy to go over board and try to put every idea possible into one corset, but I wanted it to have clean defined lines monochrome but with different textures. I’ve never done hip fins before but for this project there had to be a part that stands away from the body. 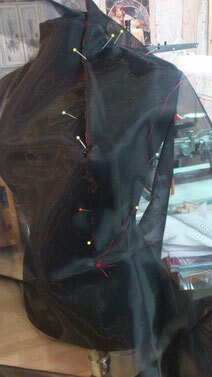 Sewing with mesh was also a first, I really like the look of it, but it’s retractable to work with. The most intimidating part however was doing the makeup on my model, myself because I couldn’t get a makeup artist for our short noticed shooting date. I’m so glad it went well and I didn’t blow up the whole thing. After taking my model’s measurements, I adapted a pattern I’d drafted some time ago. The top and bottom line had to be changed to fit my design as well as some circumference and lengths measurements. I did a Mock up which luckily fitted pretty well at the first and only fitting. My fashion layer is a lightly padded cocktail-dress fabric with an embossed honeycomb pattern. I cut the pattern pieces from spot-broche coutil, sewed boning channels to them and then fused everything to the fashion fabric. 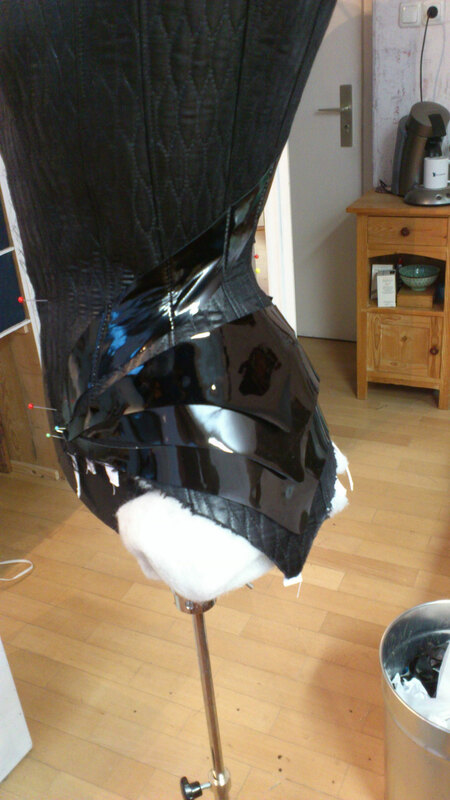 The panels were joined, all the seams flat felled and a dipped waist tape added. 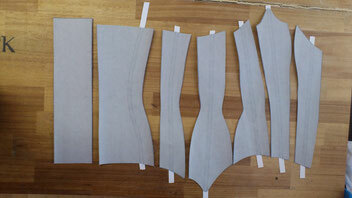 The princess seam at the bust got one more boning channel to have more support and produce a flattering shape. In total there are 14 spiral steel bones of different thickness and 8mm flat steels to enclose the eyelets. To get the streamlined look I draped a thin strip of patent leather diagonal to the waist line. The hip fins were made of much thicker material and attached only with a few stitches so they could overlap and stand away from the body. 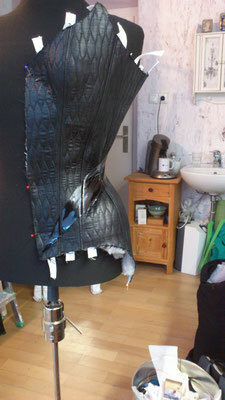 As a last step the two corset halves were combined by putting in the little mesh triangular. For a clean finish I put in a floating lining made out of silver viscose satin. To get around the pointy edges nicely, I kept the binding deliberately small. The patent leather strip was tacked with sticky tape and mounted with a single seam. 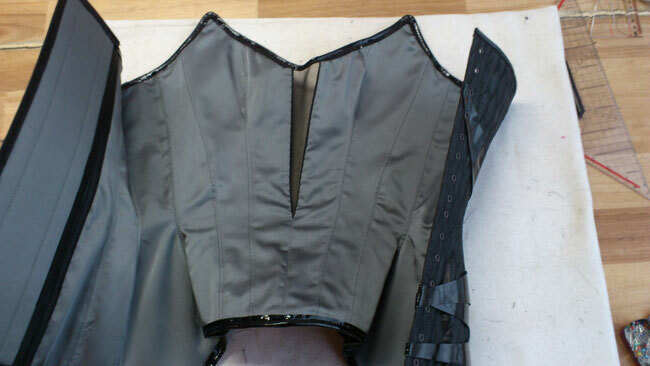 I draped the pattern for the little mesh bolero jacket on the finished corset to align the edges. 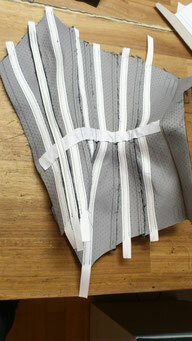 To pick up the look of the corset I covered the seam allowances and the edges with strips of patent leather. During the photo shoot the jacket really came to life with movement and gave the impression of having wings. I really liked creating this dark fantasy look. The best moment of it was in the photo studio when the whole look came together for the first time and I saw which otherworldly creature had come out of its hive.